As the moon set over the distant mass of the Warby Ranges and a golden glow in the eastern sky heralded the approaching dawn Year 9 students gathered at the Galen bus area to prepare for the departure of our annual pilgrimage to Falls Creek and a day of downhill skiing. The weather at Falls Creek was absolutely magnificent. Clear blue skies meant bright sunshine and a very comfortable air temperature of about 6 degrees. Mr Bourke’s weather predictions and decision to have the snow trip on the Friday and not the day before when strong winds had closed down the ski lifts was well and truly vindicated. As the lessons progressed many students showed how quickly they could learn and adapt to the new skills and challenges presented by this exciting sport. Of course there were a few students who struggled, but they persevered and by the end of the lesson time most had a rudimentary grasp of the basic skiing skills. 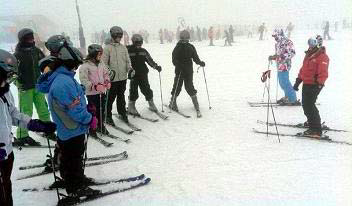 It was great to hear a number of the ski instructors comment on their cooperation and positive attitude. Following lunch students had three hours of skiing on the Drover’s Dream and Towers Ski Runs. It was amazing to see how much improvement in skiing techniques was displayed throughout the day. Thanks are extended to all Year 9 students for their participation and cooperation throughout the day, Mr Bourke and Mr Minns for their organisation along with Stephen Rosicka, John Pasztor, Paul Benedetti, Alicia Leonard, Jim Samon and Kylie Girolami for their attendance on the day. Galen was also very fortunate to have Alice Minns, Mark Staley and Paul Jaeger who volunteered to assist on the day. Their assistance and support of the Year 9 Ski Program is greatly appreciated.